Studying condensed matter response to shock wave and high pressure loading, with emphasis on real time examination and understanding of microscopic processes. 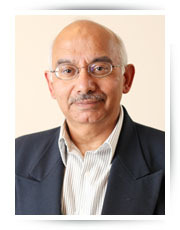 Dr. Gupta’s research activities have emphasized experimental and theoretical studies in the field of shock wave and pressure research related to the following phenomena: structural changes in crystalline solids; inelastic deformation of a wide variety of materials; chemical reactions in condensed energetic materials; and nonlinear wave propagation studies. Development of novel experimental approaches to permit real-time examination of mechanisms at various length scales (atomic to continuum) is an important element of his work. Professor Yogendra Gupta completed his Ph.D. at Washington State University (WSU) in 1972. Prior to his appointment at WSU, he spent nearly seven years at the Stanford Research Institute (now SRI International) as a Physicist, Senior Physicist and Assistant Director in the Poulter Laboratory preceded by two years of postdoctoral research. In September of 1981, Dr. Gupta joined the Department of Physics at WSU as an Associate Professor, and has been a Professor of Physics since 1984. Dr. Gupta is also the Director of the Institute for Shock Physics. Since 1970, Dr. Gupta has been engaged in experimental and theoretical research related to shock wave and high pressure compression of condensed matter. His work has emphasized real-time examination and understanding of microscopic processes using a variety of time-resolved measurements and related analyses (optical spectroscopy, x-ray diffraction, and several continuum methods). Dr. Gupta and his collaborators have worked on a broad range of condensed matter phenomena: structural transformations, chemical reactions, and deformation and fracture. These studies have resulted in over 275 publications. Currently, Professor Gupta is leading a major experimental effort to establish the Dynamic Compression Sector at the Advanced Photon Source (Argonne), a DOE/NNSA supported user facility. Since joining WSU, Dr. Gupta has supervised the work of more than 100 graduate students and research associates. 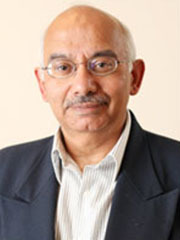 Professor Gupta is a Fellow of both the American Physical Society (1991) and the American Association for the Advancement of Science (2002). In 2001, he received the American Physical Society’s Shock Compression Science Award, the premier award in the field. In 2005, he was the recipient of Washington State University’s highest faculty recognition, the Eminent Faculty Award. N.C. Dang, Z.A Dreger, Y.M. Gupta, and D.E. Hooks. “Time-Resolved Spectroscopic Measurements of Shock-Wave Induced Decomposition in Cyclotrimethylene Trinitramine (RDX) Crystals: Anisotropic Response.” The J. of Phys. Chem. A, 114: 11560-11566 (2010). Z.A Dreger and Y.M. Gupta. “Phase Diagram of Hexahydro-1,3,5-trinitro-1,3,5-triazine Crystals at High Pressures and Temperatures.” The J. of Phys. Chem. A, 114(31): 8099-8105 (2010). Z.A. Dreger and Y.M. Gupta. “Raman Spectroscopy of High-Pressure−High-Temperature Polymorph of Hexahydro-1,3,5-trinitro-1,3,5-triazine (ε-RDX).” The J. of Phys. Chem. A, 114(26): 7038-7047 (2010). J.P. Escobedo and Y.M. Gupta. “Dynamic tensile response of Zr-based bulk amorphous alloys: Fracture morphologies and mechanisms.” J. Appl. Phys., 107(12): 123502 (2010). J.M. Lang and Y.M. Gupta. “Strength and elastic deformation of natural and synthetic diamond crystals shock compressed along .” J. Appl. Phys., 107(11): 113538 (2010). J.M. Winey and Y.M. Gupta. “Anisotropic Material Model and Wave Propagation Simulations for Shocked Pentaerythritol Tetranitrate Single Crystals.” J. Appl. Phys., 107(10): 103505-12 (2010). Z.A. Dreger, J. Zhou, N.C. Dang, and Y.M. Gupta. “Effect of High Pressure on Acoustic Properties of Several Polymers: Use of Impulsive Stimulated Light Scattering Method.” J. Appl. Phys., 109(8): 083507 (2011). J.M. Lang and Y.M. Gupta. “Experimental Determination of Third-Order Elastic Constants of Diamond.” Physical Review Letters, 106(12): 125502 (2011). P. Grivickas, M.D. McCluskey, and Y.M. Gupta. “Order-of-Magnitude Reduction of Carrier Lifetimes in  n-type GaAs Shock-Compressed to 4 GPa.” Applied Physics Letters, 98(9): 092107 (2011). N. Hemmi, K.A. Zimmerman, Z.A. Dreger, and Y. M. Gupta. “High Spectral Resolution, Real-Time, Raman Spectroscopy in Shock Compression Experiments.” Rev. of Sci. Instruments, 82(8): 083109. (2011). S.J. Turneaure and Y.M. Gupta. “Material Strength Determination in the Shock Compressed State using X-ray Diffraction Measurements.” J. Appl. Phys., 109(12): 123510. (2011). S.J. Turneaure and Y.M. Gupta. “Real-Time Microstructure of Shock Compressed Single Crystals from X-ray Diffraction Line Profiles.” J. Appl. Crystallography, 44(3): 574-584. (2011). J.A. Zimmerman, J.M. Winey and Y.M. Gupta. “Elastic Anisotropy of shocked Aluminum Single Crystals: Use of Molecular Dynamics Simulations.” Phys. Rev. B, 83(18): 184113. (2011). S.J. Turneaure and Y.M. Gupta. “Real-time x-ray diffraction at the impact surface of shocked crystals.” Journal of Applied Physics 111(2): 026101. (2012).